: A Result of the First Arms Race of the Twentieth Century….On the morning of the 16th December 1914, elements of the Imperial German Navy’s High Sea Fleet shelled three east coast towns. Scarborough, Whitby and Hartlepool all suffered damaged. Whilst Hartlepool saw the most loss of life it was the attack on Scarborough that gripped the nation’s imagination. Winston Churchill, then First Sea Lord of the Admiralty, wasted no time in condemning the act: Their hate is a measure of their fear. Its senseless expression is a proof of their impotence and the seed of their dishonor. Whatever feats of arms the German navy may hereafter perform, the stigma of the baby killers A” of Scarborough will brand its officers and men while sailors sail the sea, believe me dear Mr. Mayor.A” A handful of accounts have been published over the years primarily focusing on the day in question. However, the reasons behind this serious miscalculation on the part of the German High Command have never been articulated fully. Bob Clarke accepts that challenge, taking us on a journey from the turn of the 20th Century through to that fateful morning in 1914, it is a journey about an arms race that erupts into war. Using contemporary accounts Clarke chronicles the rise of the Dreadnought and the shifting tide of world politics through naval power. 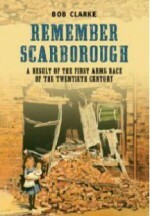 A number of theories are also offered supporting possible reasons for the bombardment of Scarborough, Whitby and Hartlepool. Bob Clarke has published a number of books covering the archaeology and history of the British Defense Landscape specialising in the Cold War. Classing himself as a ‘Scarborian’ Bob was born and educated in the town. He has since lectured on archaeological and Twentieth-Century historical matters at a number of educational establishments and is a great advocate of public archaeology. Those whom Bob has taught over the years have considered this book inevitable!